"Louis I the Fair" redirects here. For the Polish duke, see Ludwik I the Fair. 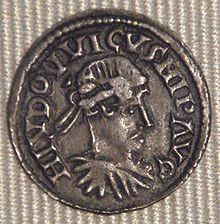 Louis the Pious (778 – 20 June 840), also called the Fair, and the Debonaire, was the King of the Franks and co-Emperor (as Louis I) with his father, Charlemagne, from 813. He was also King of Aquitaine from 781. Louis was born while his father Charlemagne was on campaign in Spain, at the Carolingian villa of Cassinogilum, according to Einhard and the anonymous chronicler called Astronomus; the place is usually identified with Chasseneuil, near Poitiers. He was the third son of Charlemagne by his wife Hildegard. His grandfather was King Pepin the Younger. Louis was one of Charlemagne's three legitimate sons to survive infancy. He had a twin brother, Lothair who died during infancy. According to Frankish custom, Louis had expected to share his inheritance with his brothers, Charles the Younger, King of Neustria, and Pepin, King of Italy. In the Divisio Regnorum of 806, Charlemagne had slated Charles the Younger as his successor as emperor and chief king, ruling over the Frankish heartland of Neustria and Austrasia, while giving Pepin the Iron Crown of Lombardy, which Charlemagne possessed by conquest. To Louis's kingdom of Aquitaine, he added Septimania, Provence, and part of Burgundy. However, Charlemagne's other legitimate sons died – Pepin in 810 and Charles in 811 – and Louis alone remained to be crowned co-emperor with Charlemagne in 813. On his father's death in 814, he inherited the entire Frankish kingdom and all its possessions (with the sole exception of Italy, which remained within Louis's empire, but under the direct rule of Bernard, Pepin's son). While at his villa of Doué-la-Fontaine, Anjou, Louis received news of his father's death. He rushed to Aachen and crowned himself emperor to shouts of Vivat Imperator Ludovicus by the attending nobles. Upon arriving at the imperial court in Aachen, one of Louis' first acts was to purge the palace of its "filth". He destroyed the old Germanic pagan tokens and texts which had been collected by Charlemagne. He further exiled members of the court he deemed morally "dissolute", including some of his own relatives. 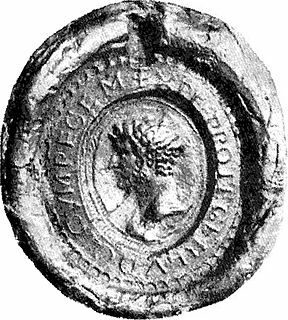 From the start of his reign, his coinage imitated his father Charlemagne's portrait, which gave it an image of imperial authority and prestige. He quickly sent all of his unmarried sisters to nunneries, to avoid any possible entanglements from overly powerful brothers-in-law. Sparing his illegitimate half-brothers, he forced his father's cousins, Adalard and Wala to be tonsured, placing them in Noirmoutier and Corbie, respectively, despite the latter's initial loyalty. His chief counsellors were Bernard, margrave of Septimania, and Ebbo, Archbishop of Reims. The latter, born a serf, was raised by Louis to that office, but betrayed him later. He retained some of his father's ministers, such as Elisachar, abbot of St. Maximin near Trier, and Hildebold, Archbishop of Cologne. Later he replaced Elisachar with Hildwin, abbot of many monasteries. He also employed Benedict of Aniane (the Second Benedict), a Septimanian Visigoth and monastic founder, to help him reform the Frankish church. One of Benedict's primary reforms was to ensure that all religious houses in Louis' realm adhered to the Rule of Saint Benedict, named for its creator, Benedict of Nursia (480–550), the First Benedict. 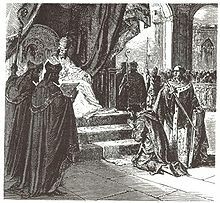 In 816, Pope Stephen IV, who had succeeded Leo III, visited Reims and again crowned Louis (Sunday 5 October). 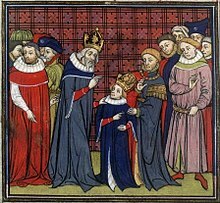 Lothair was proclaimed and crowned co-emperor in Aachen by his father. He was promised the succession to most of the Frankish dominions (excluding the exceptions below), and would be the overlord of his brothers and cousin. Pepin was proclaimed King of Aquitaine, his territory including Gascony, the march around Toulouse, and the counties of Carcassonne, Autun, Avallon and Nevers. Louis, the youngest son, was proclaimed King of Bavaria and the neighbouring marches. If one of the subordinate kings died, he was to be succeeded by his sons. If he died childless, Lothair would inherit his kingdom. In the event of Lothair dying without sons, one of Louis the Pious' younger sons would be chosen to replace him by "the people". Above all, the Empire would not be divided: the Emperor would rule supreme over the subordinate kings, whose obedience to him was mandatory. With this settlement, Louis tried to combine his sense for the Empire's unity, supported by the clergy, while at the same time providing positions for all of his sons. Instead of treating his sons equally in status and land, he elevated his first-born son Lothair above his younger brothers and gave him the largest part of the Empire as his share. The ordinatio imperii of Aachen left Bernard of Italy in an uncertain and subordinate position as king of Italy, and he began plotting to declare independence upon hearing of it. Louis immediately directed his army towards Italy, and betook himself to Chalon-sur-Saône. Intimidated by the emperor's swift action, Bernard met his uncle at Chalon, under invitation, and surrendered. He was taken to Aachen by Louis, who there had him tried and condemned to death for treason. Louis had the sentence commuted to blinding, which was duly carried out; Bernard did not survive the ordeal, however, dying after two days of agony. Others also suffered: Theodulf of Orléans, in eclipse since the death of Charlemagne, was accused of having supported the rebellion, and was thrown into a monastic prison, dying soon afterwards; it was rumored that he had been poisoned. The fate of his nephew deeply marked Louis's conscience for the rest of his life. In 822, as a deeply religious man, Louis performed penance for causing Bernard's death, at his palace of Attigny near Vouziers in the Ardennes, before Pope Paschal I, and a council of ecclesiastics and nobles of the realm that had been convened for the reconciliation of Louis with his three younger half-brothers, Hugo whom he soon made abbot of St-Quentin, Drogo whom he soon made Bishop of Metz, and Theodoric. This act of contrition, partly in emulation of Theodosius I, had the effect of greatly reducing his prestige as a Frankish ruler, for he also recited a list of minor offences about which no secular ruler of the time would have taken any notice. He also made the egregious error of releasing Wala and Adalard from their monastic confinements, placing the former in a position of power in the court of Lothair and the latter in a position in his own house. At the start of Louis's reign, the many tribes – Danes, Obotrites, Slovenes, Bretons, Basques – which inhabited his frontierlands were still in awe of the Frankish emperor's power and dared not stir up any trouble. In 816, however, the Sorbs rebelled and were quickly followed by Slavomir, chief of the Obotrites, who was captured and abandoned by his own people, being replaced by Ceadrag in 818. Soon, Ceadrag too had turned against the Franks and allied with the Danes, who were to become the greatest menace of the Franks in a short time. A greater Slavic menace was gathering on the southeast. There, Ljudevit, duke of Pannonia, was harassing the border at the Drava and Sava rivers. The margrave of Friuli, Cadolah, was sent out against him, but he died on campaign and, in 820, his margarvate was invaded by Slovenes. In 821, an alliance was made with Borna, duke of the Dalmatia, and Liudewit was brought to heel. In 824 several Slav tribes in the north-western parts of Bulgaria acknowledged Louis's suzerainty and after he was reluctant to settle the matter peacefully with the Bulgarian ruler Omurtag, in 827 the Bulgarians attacked the Franks in Pannonia and regained their lands. On the far southern edge of his great realm, Louis had to control the Lombard princes of Benevento whom Charlemagne had never subjugated. He extracted promises from Princes Grimoald IV and Sico, but to no effect. On the southwestern frontier, problems commenced early when c. 812, Louis the Pious crossed the western Pyrenees 'to settle matters' in Pamplona. The expedition made its way back north, where it narrowly escaped an ambush attempt arranged by the Basques in the pass of Roncevaux thanks to the precautions he took, i.e. hostages. Séguin, duke of Gascony, was then deposed by Louis in 816, possibly for failing to suppress or collaborating with the Basque revolt south of the western Pyrenees, so sparking off a Basque uprising that was duly put down by the Frankish emperor in Dax. 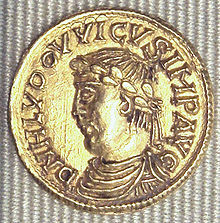 Seguin was replaced by Lupus III, who was dispossessed in 818 by the emperor. 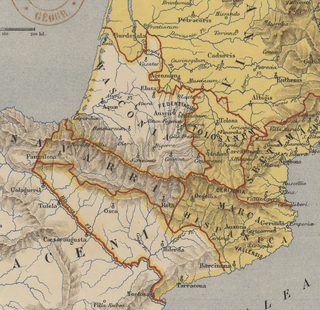 In 820 an assembly at Quierzy-sur-Oise decided to send an expedition against the Cordoban caliphate (827). The counts in charge of the army, Hugh, count of Tours, and Matfrid, count of Orléans, were slow in acting and the expedition came to naught. In 818, as Louis was returning from a campaign to Brittany, he was greeted by news of the death of his wife, Ermengarde. Ermengarde was the daughter of Ingerman, the duke of Hesbaye. Louis had been close to his wife, who had been involved in policymaking. It was rumoured that she had played a part in her nephew's death and Louis himself believed her own death was divine retribution for that event. It took many months for his courtiers and advisors to convince him to remarry, but eventually he did, in 820, to Judith, daughter of Welf, count of Altdorf. In 823 Judith gave birth to a son, who was named Charles. The birth of this son damaged the Partition of Aachen, as Louis's attempts to provide for his fourth son met with stiff resistance from his older sons, and the last two decades of his reign were marked by civil war. At Worms in 829, Louis gave Alemannia to Charles, with the title of king or duke (historians differ on this), thus enraging his son and co-emperor Lothair, whose promised share was thereby diminished. An insurrection was soon at hand. With the urging of the vengeful Wala and the cooperation of his brothers, Lothair accused Judith of having committed adultery with Bernard of Septimania, even suggesting Bernard to be the true father of Charles. Ebbo and Hildwin abandoned the emperor at that point, Bernard having risen to greater heights than either of them. Agobard, Archbishop of Lyon, and Jesse, bishop of Amiens, too, opposed the redivision of the empire and lent their episcopal prestige to the rebels. In 830, at Wala's insistence that Bernard of Septimania was plotting against him, Pepin of Aquitaine led an army of Gascons, with the support of the Neustrian magnates, all the way to Paris. At Verberie, Louis the German joined him. At that time, the emperor returned from another campaign in Brittany to find his empire at war with itself. He marched as far as Compiègne, an ancient royal town, before being surrounded by Pepin's forces and captured. Judith was incarcerated at Poitiers and Bernard fled to Barcelona. Then Lothair finally set out with a large Lombard army, but Louis had promised his sons Louis the German and Pepin of Aquitaine greater shares of the inheritance, prompting them to shift loyalties in favour of their father. When Lothair tried to call a general council of the realm in Nijmegen, in the heart of Austrasia, the Austrasians and Rhinelanders came with a following of armed retainers, and the disloyal sons were forced to free their father and bow at his feet (831). Lothair was pardoned, but disgraced and banished to Italy. Pepin returned to Aquitaine and Judith – after being forced to humiliate herself with a solemn oath of innocence – to Louis's court. Only Wala was severely dealt with, making his way to a secluded monastery on the shores of Lake Geneva. Although Hilduin, abbot of Saint Denis, was exiled to Paderborn and Elisachar and Matfrid were deprived of their honours north of the Alps; they did not lose their freedom. The next revolt occurred a mere two years later, in 832. The disaffected Pepin was summoned to his father's court, where he was so poorly received he left against his father's orders. Immediately, fearing that Pepin would be stirred up to revolt by his nobles and desiring to reform his morals, Louis the Pious summoned all his forces to meet in Aquitaine in preparation of an uprising, but Louis the German garnered an army of Slav allies and conquered Swabia before the emperor could react. Once again the elder Louis divided his vast realm. At Jonac, he declared Charles king of Aquitaine and deprived Pepin (he was less harsh with the younger Louis), restoring the whole rest of the empire to Lothair, not yet involved in the civil war. Lothair was, however, interested in usurping his father's authority. His ministers had been in contact with Pepin and may have convinced him and Louis the German to rebel, promising him Alemannia, the kingdom of Charles. Soon Lothair, with the support of Pope Gregory IV, whom he had confirmed in office without his father's support, joined the revolt in 833. While Louis was at Worms gathering a new force, Lothair marched north. Louis marched south. The armies met on the plains of the Rothfeld. There, Gregory met the emperor and may have tried to sow dissension amongst his ranks. Soon much of Louis's army had evaporated before his eyes, and he ordered his few remaining followers to go, because "it would be a pity if any man lost his life or limb on my account." The resigned emperor was taken to Saint-Médard de Soissons, his son Charles to Prüm, and the queen to Tortona. The despicable show of disloyalty and disingenuousness earned the site the name Field of Lies, or Lügenfeld, or Campus Mendacii, ubi plurimorum fidelitas exstincta est. Louis on a sesquisolidus, essentially Roman in design. On 13 November 833, Ebbo, with Agobard of Lyon, presided over a synod at the Church of Saint Medard in Soissons which saw Louis undertake public penance for the second time in his reign. The penitential ritual that was undertaken began when Louis arrived at the church and confessed multiple times to the crimes levied against him. The crimes had been historic and recent, with accusations of oath breaking, violation of the public peace and inability to control his adulterous wife, Judith of Bavaria. Afterwards, he threw his sword belt at the base of the altar and received judgement through the imposition of the hands of the bishops. Louis was to live the rest of his life as a penitent, never to hold office again. The penance divided the aristocracy. The anonymous biographer of the Vita Hludovici criticized the whole affair on the basis that God does not judge twice for sins committed and confessed. Lothair's allies were generously compensated. Ebbo himself received the monastery of St Vaast whilst Pepin was allowed to keep the lands reclaimed from his father. Men like Rabanus Maurus, Louis' younger half-brothers Drogo and Hugh, and Emma, Judith's sister and Louis the German's new wife, worked on the younger Louis to make peace with his father, for the sake of unity of the empire. The humiliation to which Louis was then subjected at Notre Dame in Compiègne turned the loyal barons of Austrasia and Saxony against Lothair, and the usurper fled to Burgundy, skirmishing with loyalists near Chalon-sur-Saône. Louis was restored the next year, on 1 March 834. On Lothair's return to Italy, Wala, Jesse, and Matfrid, formerly count of Orléans, died of a pestilence. On 2 February 835 at the palace Thionville, Louis presided over a general council to deal with the events of the previous year. Known as the Synod of Thionville, Louis himself was reinvested with his ancestral garb and the crown, symbols of Carolingian rulership. Furthermore, the penance of 833 was officially reversed and Archbishop Ebbo officially resigned after confessing to a capital crime, whilst Agobard of Lyon and Bartholmew, Archbishop of Narbonne were also deposed. Later that year Lothair fell ill; once again the events turned in Louis favour. In 836, however, the family made peace and Louis restored Pepin and Louis, deprived Lothair of all save Italy, and gave it to Charles in a new division, given at the diet of Crémieu. At about that time, the Vikings terrorized and sacked Utrecht and Antwerp. In 837, they went up the Rhine as far as Nijmegen, and their king, Rorik, demanded the wergild of some of his followers killed on previous expeditions before Louis the Pious mustered a massive force and marched against them. They fled, but it would not be the last time they harried the northern coasts. In 838, they even claimed sovereignty over Frisia, but a treaty was confirmed between them and the Franks in 839. Louis the Pious ordered the construction of a North Sea fleet and the sending of missi dominici into Frisia to establish Frankish sovereignty there. In 837, Louis crowned Charles king over all of Alemannia and Burgundy and gave him a portion of his brother Louis' land. Louis the German promptly rose in revolt, and the emperor redivided his realm again at Quierzy-sur-Oise, giving all of the young king of Bavaria's lands, save Bavaria itself, to Charles. Emperor Louis did not stop there, however. His devotion to Charles knew no bounds. When Pepin died in 838, Louis declared Charles the new king of Aquitaine. The nobles, however, elected Pepin's son Pepin II. When Louis threatened invasion, the third great civil war of his reign broke out. In the spring of 839, Louis the German invaded Swabia, Pepin II and his Gascon subjects fought all the way to the Loire, and the Danes returned to ravage the Frisian coast (sacking Dorestad for a second time). Lothair, for the first time in a long time, allied with his father and pledged support at Worms in exchange for a redivision of the inheritance. At a final placitum held at Worms on 20 May, Louis gave Bavaria to Louis the German and disinherited Pepin II, leaving the entire remainder of the empire to be divided roughly into an eastern part and a western. Lothair was given the choice of which partition he would inherit and he chose the eastern, including Italy, leaving the western for Charles. The emperor quickly subjugated Aquitaine and had Charles recognised by the nobles and clergy at Clermont-en-Auvergne in 840. Louis then, in a final flash of glory, rushed into Bavaria and forced the younger Louis into the Ostmark. The empire now settled as he had declared it at Worms, he returned in July to Frankfurt am Main, where he disbanded the army. The final civil war of his reign was over. Louis fell ill soon after his final victorious campaigns and went to his summer hunting lodge on an island in the Rhine, by his palace at Ingelheim. He died 20 June 840 in the presence of many bishops and clerics and in the arms of his half-brother Drogo, though Charles and Judith were absent in Poitiers. Soon dispute plunged the surviving brothers into a civil war that was only settled in 843 by the Treaty of Verdun, which split the Frankish realm into three parts, to become the kernels of France and Germany, with Burgundy and the Low Countries between them. The dispute over the kingship of Aquitaine was not fully settled until 860. Louis was buried in the Abbey of Saint-Arnould in Metz. ^ Latin: Ludovicus or Hludowicus Pius, German: Ludwig der Fromme, French: Louis le Pieux or Louis le Débonnaire, Italian: Luigi il Pio or Ludovico il Pio, Spanish: Luis el Piadoso or Ludovico Pío. ^ Einhard gives the name of his birthplace as Cassanoilum. In addition to Chasseneuil near Poitiers, scholars have suggested that Louis may have been born at Casseneuil (Lot et Garonne) or at Casseuil on the Garonne near La Réole, where the Dropt flows into the Garonne. ^ Pierre Riche, The Carolingians:The Family who Forged Europe, 94. ^ a b c d Church Architecture and Liturgy in the Carolingian Era, Michael S. Driscoll, A Companion to the Eucharist in the Middle Ages, ed. Ian Levy, Gary Macy, Kristen Van Ausdall, (Brill, 2012), 194. ^ Church Architecture and Liturgy in the Carolingian Era, Michael S. Driscoll, A Companion to the Eucharist in the Middle Ages, 195. ^ The Frankish Kingdoms, 814-898:the West, Janet L. Nelson, The New Cambridge Medieval History, 700–900, Vol. II, ed. Rosamond McKitterick, (Cambridge University Press, 1995), 114. ^ Paired gold medallions of father and son had been struck on the occasion of the synod of Paris (825) that asserted Frankish claims as emperor, recently denigrated by the Byzantines; see Karl F. Morrison, "The Gold Medallions of Louis the Pious and Lothaire I and the Synod of Paris (825)" Speculum 36.4 (October 1961:592–599). ^ Mayke De Jong, "Power and Humility in Carolingian society: the Public Penance of Louis the Pious", Early Medieval Europe 1 (1992). p. 29. ^ Agobard, "Personal Attestation to the Penance of Louis the Pious" in Lievan Van Acker (ed.) Corpus Christianorum Continuatio Medievalis , trans. Courtney M. Booker (Turnhout, 1981). p. 324. ^ Mayke De Jong, The Penitential State: Authority and Atonement in the Age of Louis the Pious, 814-840 (Cambridge, 2009), pp. 1- 3. ^ The Astronomer, The Life of Emperor Louis, trans. Thomas F.X. Noble (Pennsylvania, 2009), p. 282. ^ The Annals of Saint Bertin, trans. Janet L. Nelson (Manchester, 1991), pp. 32- 33. ^ Metz, Steven Fanning, Medieval France:An Encyclopedia, Ed. William W. Kibler and Grover A. Zinn, (Routledge, 1995), p. 615. ^ McKitterick 2008, p. 93. 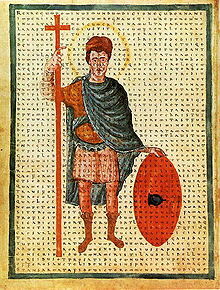 Wikimedia Commons has media related to Louis the Pious. Charles the Bald was the King of West Francia (843–877), King of Italy (875–877) and Holy Roman Emperor. After a series of civil wars during the reign of his father, Louis the Pious, Charles succeeded by the Treaty of Verdun (843) in acquiring the western third of the Carolingian Empire. He was a grandson of Charlemagne and the youngest son of Louis the Pious by his second wife, Judith. Bernard was the King of the Lombards from 810 to 818. He plotted against his uncle, Emperor Louis the Pious, when the latter's Ordinatio Imperii made Bernard a vassal of his cousin Lothair. When his plot was discovered, Louis had him blinded, a procedure which killed him. Pepin I or Pepin I of Aquitaine was King of Aquitaine and Duke of Maine. Ebbo or Ebo was archbishop of Rheims from 816 until 835 and again from 840 to 841. He was born a German serf on the royal demesne of Charlemagne. He was educated at his court and became the librarian and councillor of Louis the Pious, king of Aquitaine, son of Charlemagne. When Louis became emperor, he appointed Ebbo to the see of Rheims, then vacant after the death of Wulfaire.